Police in Sudan have fired tear gas at football fans demanding an end to President Omar al-Bashir’s rule as protests spread across the country. Opposition figures say 22 protesters have been killed since Wednesday, but officials say the figure is much lower. But they have escalated into calls for an end to Mr Bashir’s 29-year rule. Over the past year, the cost of some goods has more than doubled, while overall inflation has risen to nearly 70%, the value of the Sudanese pound has fallen sharply and shortages have been reported in cities including Khartoum. Doctors embarked on a strike on Monday to increase pressure on Mr Bashir, who took power in a coup in 1989, the Associated Press news agency reports. Sunday’s clashes happened as crowds of people spilled out of a football match in Khartoum. Earlier, footage on social media appeared to show continuing protests in a number of areas. The Central Sudanese Committee of Doctors said its members had seen protesters in hospitals with gunshot wounds and said there had been a number of deaths and injuries. On Saturday the authorities arrested 14 leaders of the National Consensus Forces, an opposition coalition, including the grouping’s 85-year-old leader Farouk Abu Issa, a spokesman said. “We demand their immediate release, and their arrest is an attempt by the regime to stop the street movements,” spokesman Sadiq Youssef said. On Saturday Sadiq al-Mahdi, leader of the main opposition Umma party, condemned “armed repression” and said the protests were fuelled by the “deteriorating situation” in the country. He also called for Mr Bashir’s government to agree a peaceful transfer of power or face a confrontation with the Sudanese people. 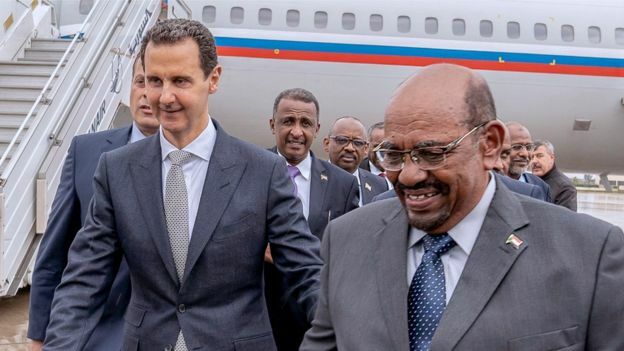 “It will be a losing confrontation for the regime, as it will increase its failures and closes its horizons,” the Paris-based Sudan Tribune website quoted him as saying. Mr Mahdi – who was was prime minister from 1966 to 1967 and again from 1986 to 1989 – returned from almost a year in exile on Wednesday. His government was the last to be democratically elected in the country and was toppled in the coup launched by Mr Bashir, who has since been accused of war crimes and crimes against humanity in Sudan’s western region of Darfur by the International Criminal Court. They started in the eastern town of Atbara, where demonstrators burned the offices of Mr Bashir’s National Congress Party (NCP). Witnesses said that in some areas the military was not intervening and even appeared to be siding with the demonstrators. But in a statement on Sunday the military pledged loyalty to Mr Bashir and said it would safeguard the “nation’s security, safety along with its blood, honour and assets”. A presidential adviser, Faisal Hassan Ibrahim, said the protests were being directed by “organised entities”, without giving further details. Demonstrations spread to Khartoum and its twin city Omdurman as well as other areas. 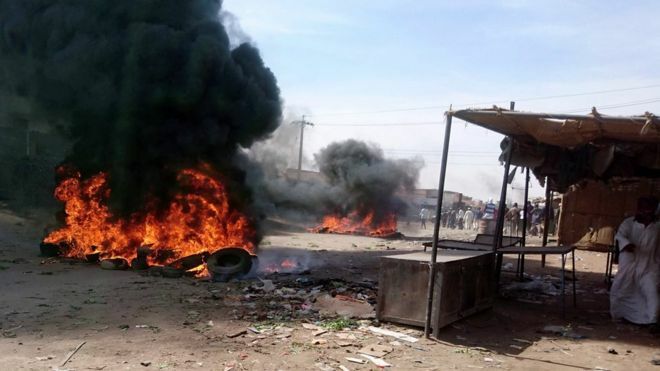 On Saturday AFP quoted witnesses in Wad Madani, south-east of Khartoum, as saying police used tear gas and beat protesters calling for Mr Bashir to step down. 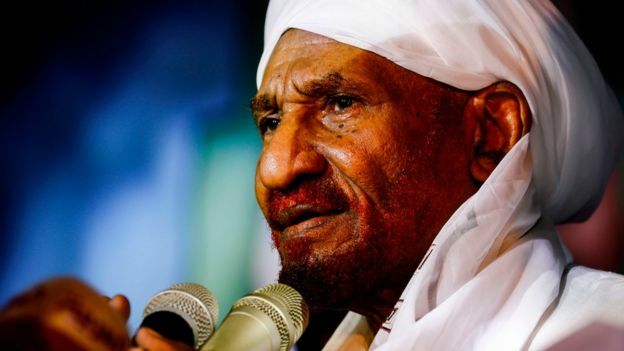 In El Rahad, south-west of Khartoum, the NCP office and other administrative offices were set ablaze and protesters chanting “no to hunger” were tear-gassed, another witness said. Why is Sudan’s economy in trouble? Mr Bashir was accused of sponsoring terrorism by the US in the 1990s and Sudan was placed under a trade embargo. In 2011, South Sudan seceded from Sudan, taking with it three-quarters of the country’s oil resources. That followed a civil war that claimed the lives of 1.5 million people. Meanwhile, the conflict in Darfur drove about two million people from their homes and killed more than 200,000. US sanctions were lifted in 2017 but there has been little improvement in the country’s economy since.